Play this song to hear what we want to see at the show! ...and this one to hear what we don't want! 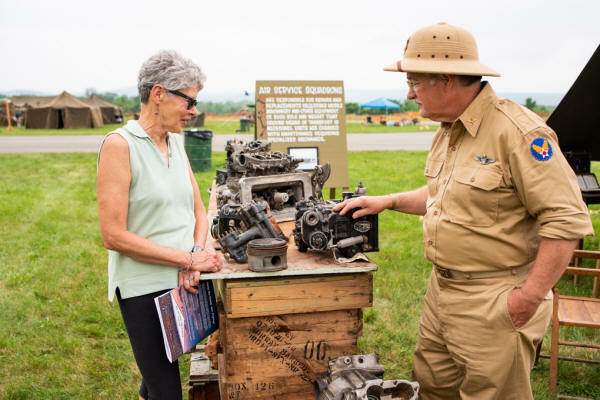 FOR A COMPLETE SCHEDULE OF EVENTS, AND MUCH MORE, PICK UP A COPY OF "WAR NEWS" , THE PROGRAM OF WWII WEEKEND, AT THE ENTRY GATES AND THE MAAM PX TENT ON THE RAMP. Gates open at 8:30* each day for the nation's largest and best historic commemoration of the life and times of America's "Greatest Generation"..
Friday and Saturday shows end at 10:00 PM, after the Hangar Dances. The Sunday show ends promptly at 5:00 so that clean-up can get underway. Friday is "A-Day" - Arrival Day. 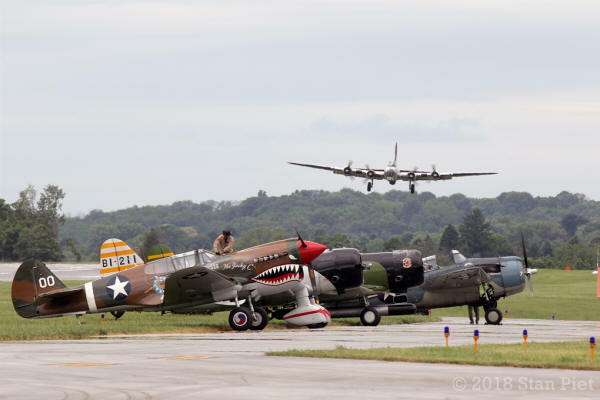 Aircraft not already on the field will be arriving throughout the day and all of the planes booking rides will also be in full swing on Friday. On Friday at 11:00, you can get up-close looks of the operating military vehicles as the "Liberation of Reading" convoy moves out from the airport to the city center and returns in the afternoon. *In some cases an autograph fee may be charged by the Special Guest. 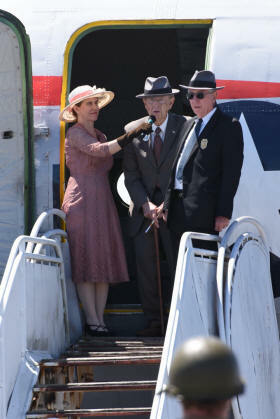 Hear the veterans' fascinating, first-person accounts, presented daily on stage and in the briefing tent. The Special Guest speakers' schedules will be posted at each speaking venue. 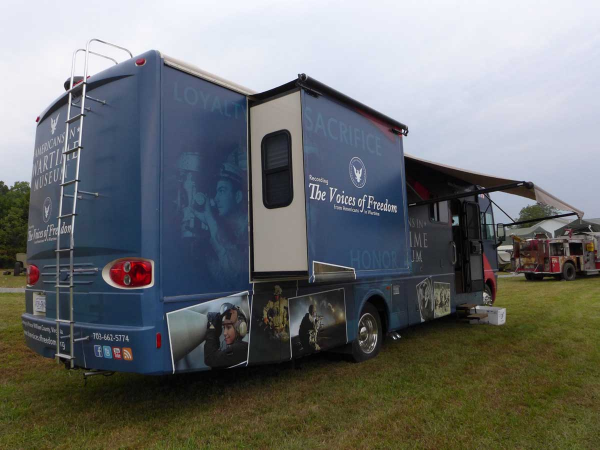 The Oral History Van of the American Wartime Museum of Nokesville, Virginia will be on site to conduct interviews with veterans. 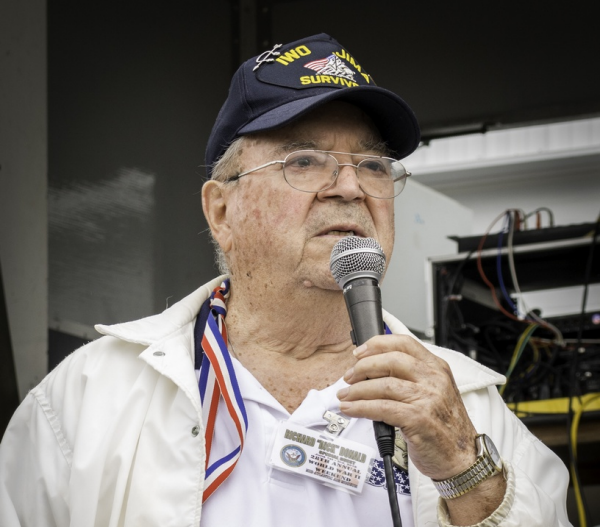 A copy of the interview will be provided to the Library of Congress Veterans History Project, and participating veterans will be given a copy for their families at no cost. 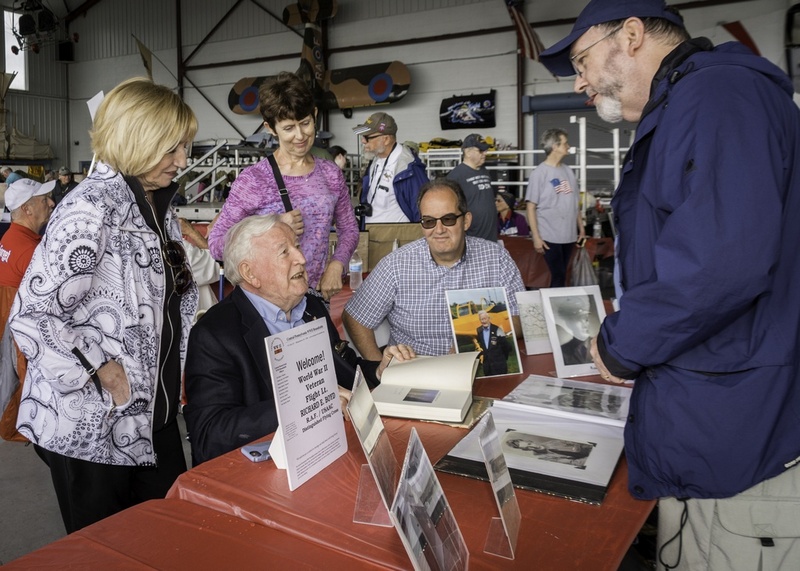 Again this year the WW2 History Archive staffers will be manning a booth in the hangar, carrying out their mission: to focus on the preservation of the experiences of WW2 Veterans through oral history interviews. 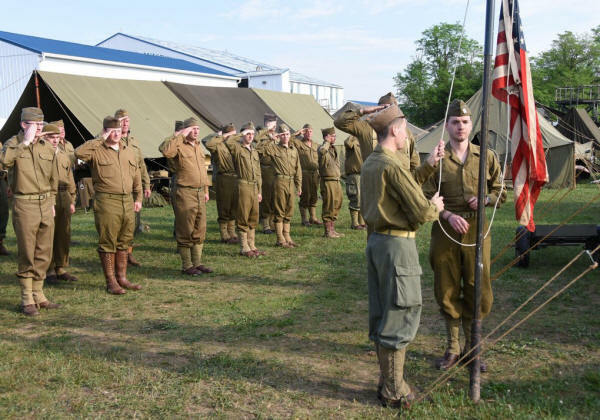 More than 1,700 WWII military and civilian re-enactors and dozens of combat and support units, representing many nations, will be all around you. 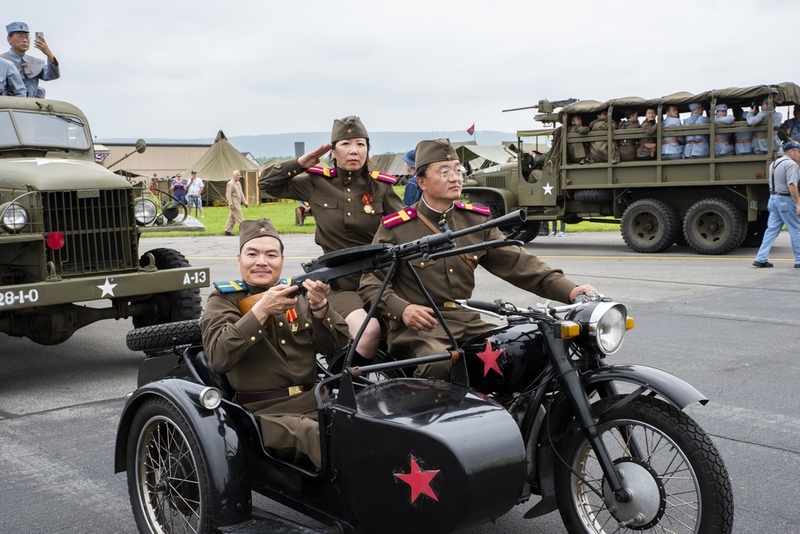 See up to 200 military vehicles, from motorcycles to Jeeps to tanks - the biggest gathering in the country. Hear the thunder of tanks and artillery pieces being fired. Experience battles and skirmishes between the French Resistance, Allied and German troops around the battle-scarred French Village. 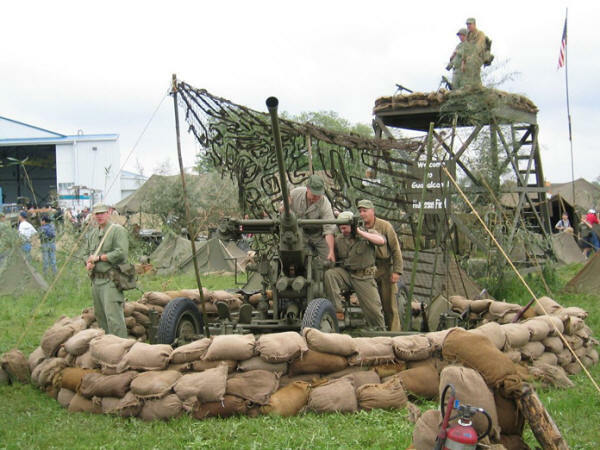 Reconnoiter the seven sprawling encampments and experience what life was like for the "G.I. 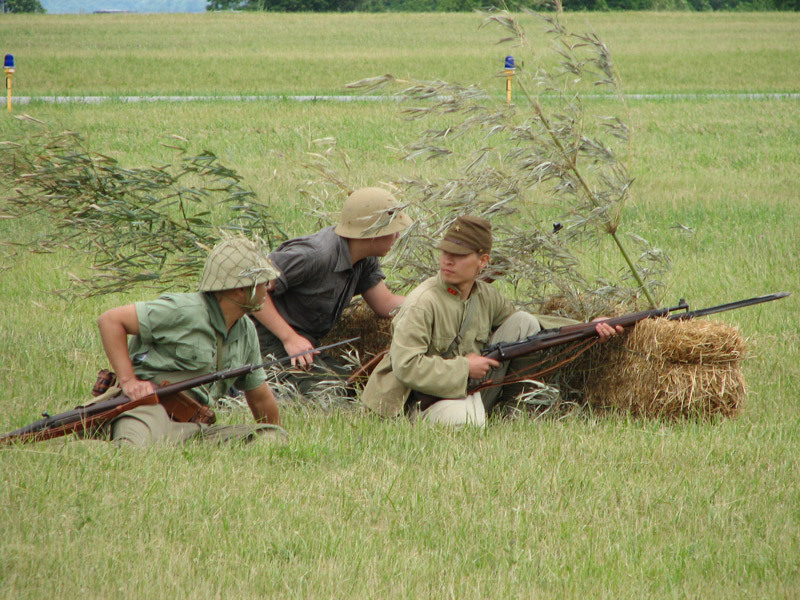 Joe's", "Tommies", "Diggers", "Ivans", "Jerries", and other Allied and Axis soldiers in the field. 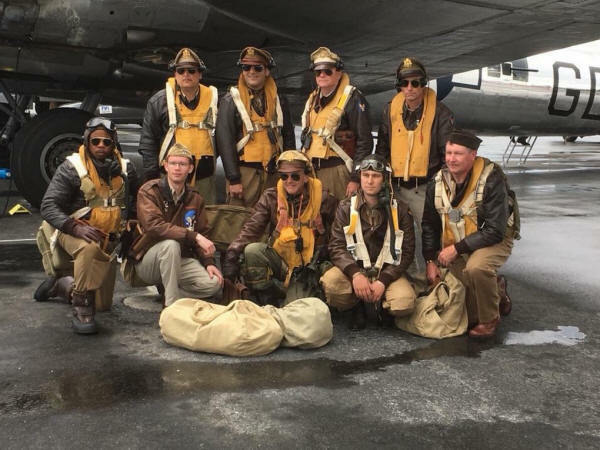 You can visit the Pacific and European theaters, U.S. Navy, Marine, and Army, encampments, British Commonwealth forces, German Wehrmacht and Luftwaffe camps, and more. Visit the Base Club near the Home Front where you can enjoy coffee and donuts in the morning, or sip a Coke while listening to the fabulous vocal styling of Theresa Eaman. 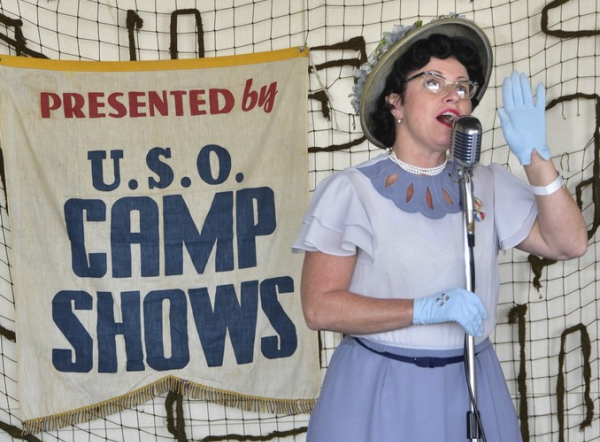 Our favorite songstress has been performing at MAAM's World War II Weekend longer than any other entertainer. 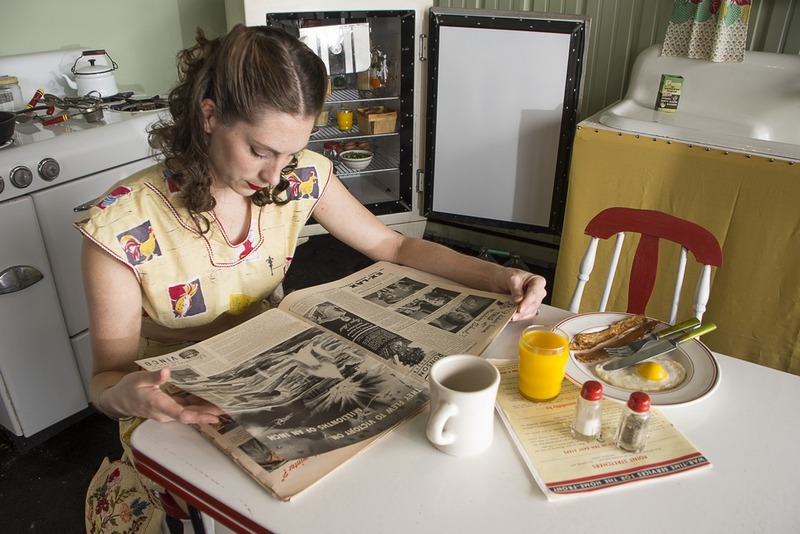 You can catch her act throughout the day, not only at the Club, but also on the ramp Outside Stage, and perhaps even from the bed of a "deuce and a half" truck, on occasion! So keep an eye and ear out for this talented lady. We are delighted to have the Martin Sisters Band again at this year's WWII Weekend. 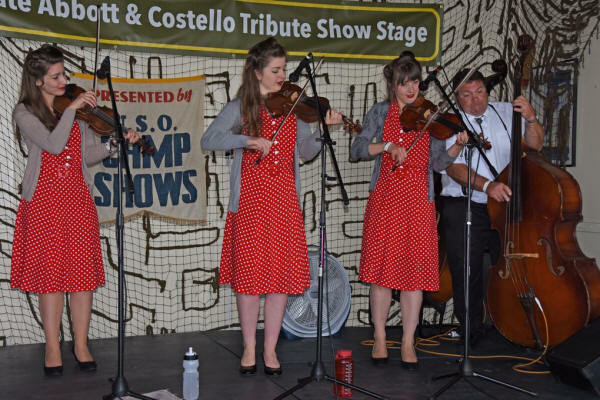 Champion fiddlers, Emily, Melissa, and Christy, along with guitar player, Butch Imhoff and bass player, Eric Fisher, will entertain you with their three part harmonies and bring you a lively mix of Western Swing, 40's Swing and Jazz. 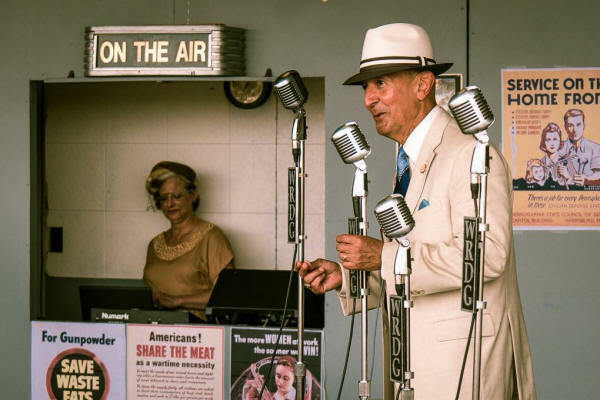 Retired USMC Colonel and accomplished singer Frank Cubillo presents "Frank Sings Frank". His repertoire includes over 180 Sinatra hits, so get ready to hear your favorite from "Old Blue Eyes". 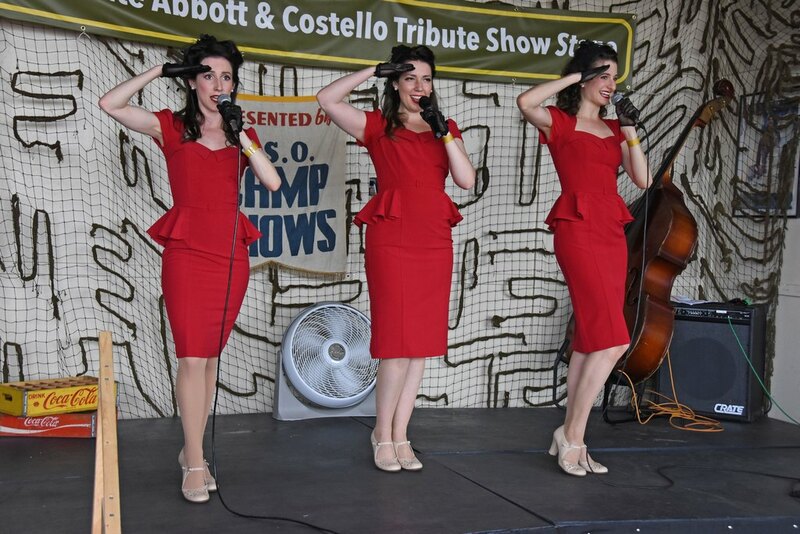 Once again,"America's Sweethearts" will sing and swing some tunes of the time. 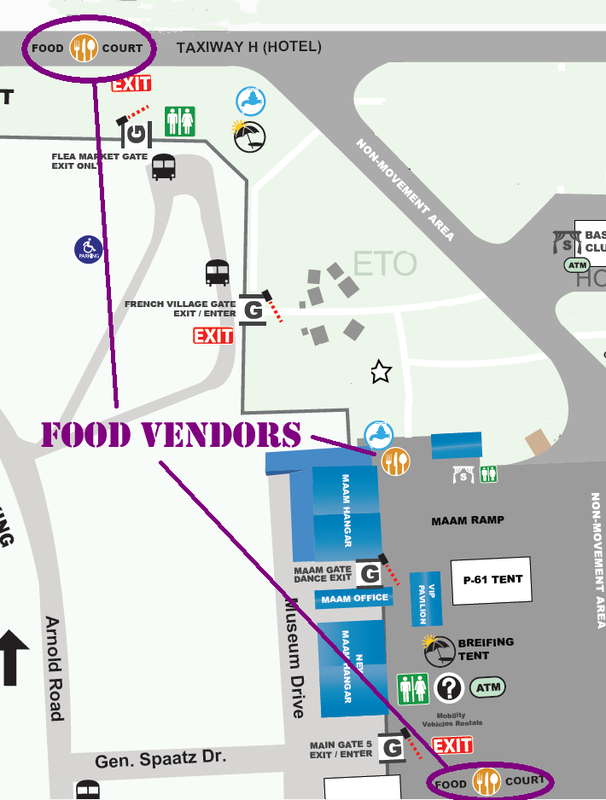 Be sure to catch them at the Base Club stage at the Home Front, or right here for a YouTube preview. New in the entertainment camp this year is Forecast. 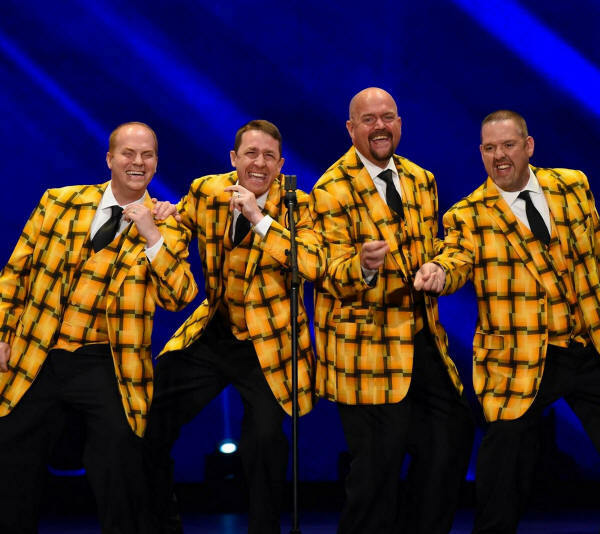 This men's a cappella barbershop quartet, members of the Mid-Atlantic District of the Barbershop Harmony Society, consists of Mike, Tyler, Travis, and Kevin. Be sure to catch their four-part harmonies at various entertainment stages around the field throughout the weekend. On both Saturday and Sunday at 11:30, enjoy the latest fashions of 1944 for all ages, modeled on Officers' Club Stage. 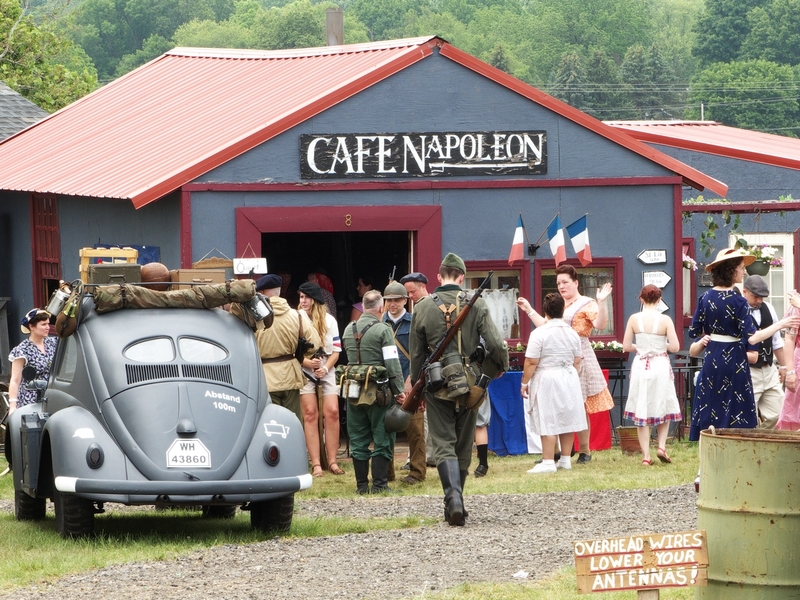 Stroll along "Main Street 1944" as you explore the Home Front area at World War II Weekend. 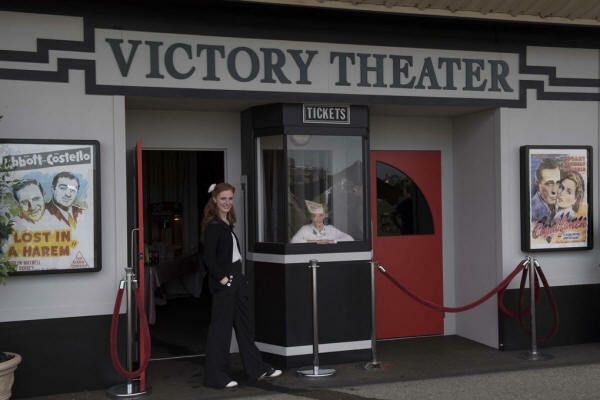 You can step back in time and into the new Victory Theater. Here, running continuously throughout the three-day event, you will be entertained and informed by WWII vintage cartoons and short features. So take a load off those tired dogs, have a seat, and enjoy some freshly popped corn. 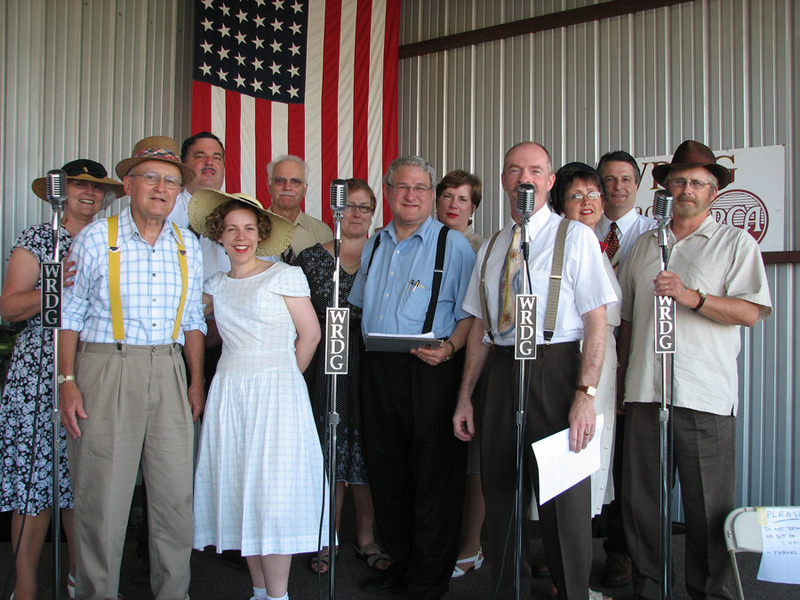 Also, at the Home Front, join the audience for a live radio broadcast drama by S.O.A.P., the "Spirit of the Airways Players" at the recreated studio of station "WRDG". You may even catch Bob Hope's USO show. Specific performance times will be posted on a board outside the studio, throughout the weekend. 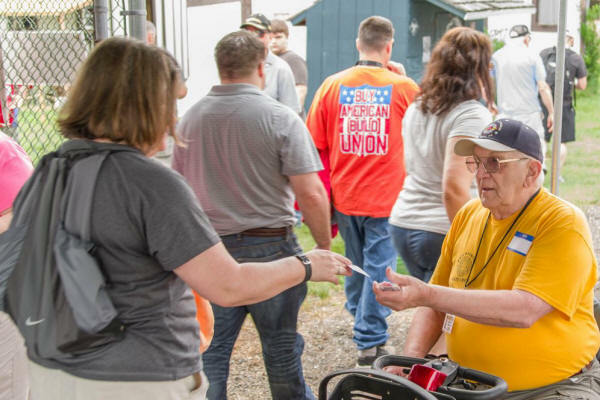 A representative of the U.S. Department of Veterans Affairs will be on hand at this year's show to assist veterans and answer their questions regarding VA services and programs. 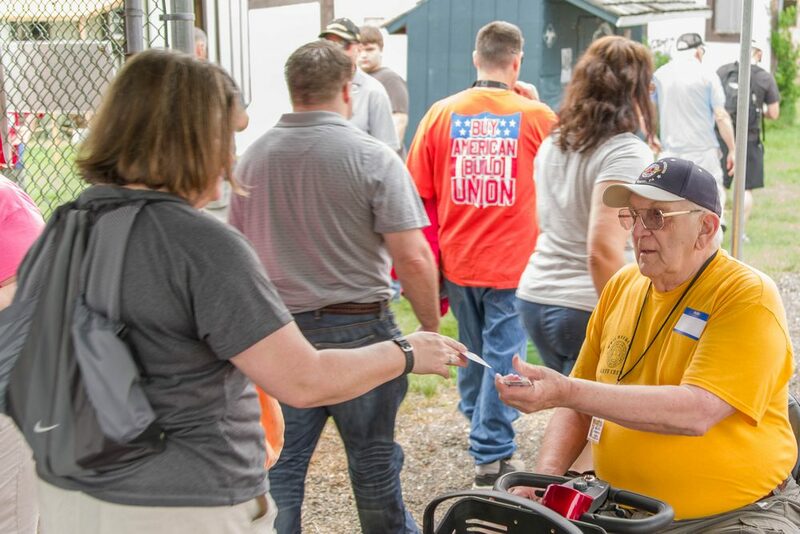 If you are a veteran and have not yet done so, you owe it to yourself to take advantage of the VA benefits that you have earned. On Friday evening, at 5:00, while the Main Hangar is cleared out for the upcoming big band performance, enjoy the Friday evening ham dinner. Then on Saturday at 5:00, before the dance you can enjoy the chicken BBQ dinner. *Separate, Advance tickets are required for evening meals. Meal tickets will NOT be available at the show. Included with any WWII Weekend admission ticket, you can enjoy the fabulous ‘40’s Big Band concerts and dances on both Friday & Saturday evening, from 7:00 to 10:00 closing time. 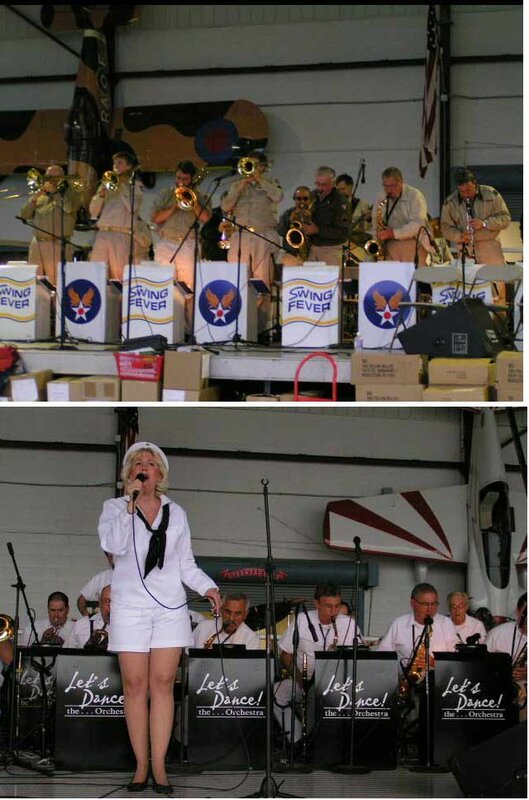 On Friday you'll swing to the "Let's Dance" big band, appearing as Artie Shaw's USN Big Band. 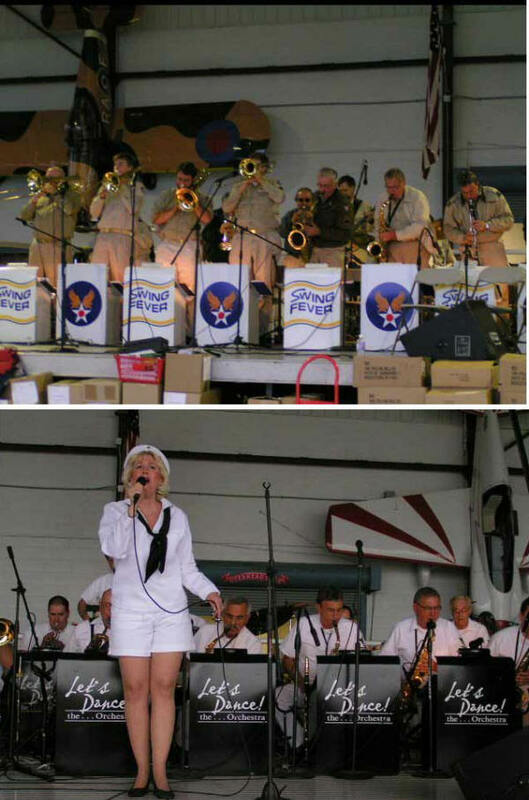 Then on Saturday, it will be the Glenn Miller, USAAF style "Swing Fever" band that will set your feet to tapping. Click here for information on Evening Admission Tickets to attend the dance and/or evening meals, only. 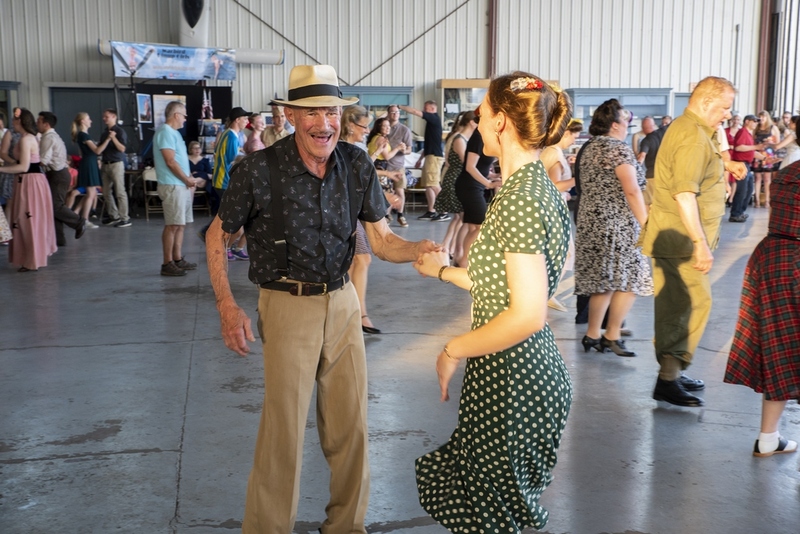 On Friday and Saturday from 7:00 to 10:00, you'll find expert swing dancers and tyros alike dancing in the Main Hangar . 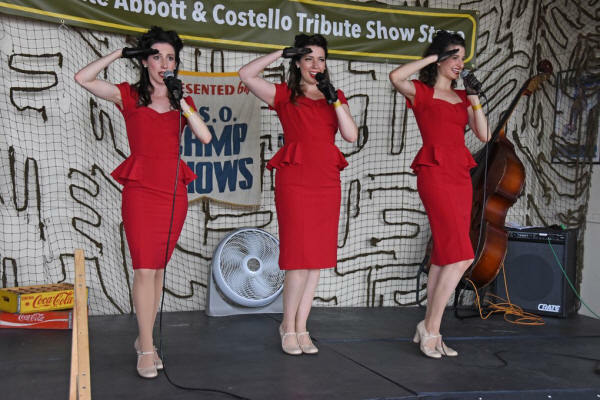 Don't be surprised if the swinging sounds make you feel like cutting a rug, yourself! ...and thrill to the recreation of the iconic flag-raising on Mt. 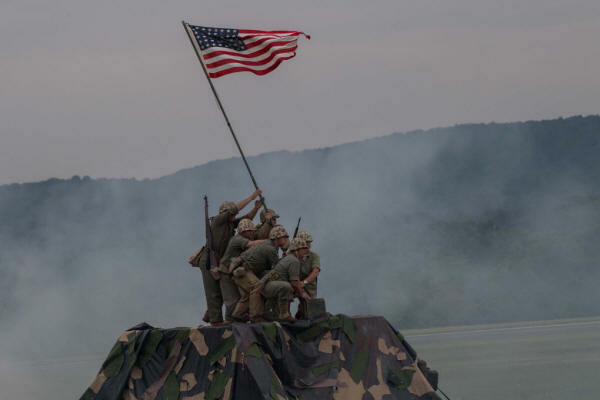 Suribachi by the USMC Living History Detachment from Parris Island, SC. 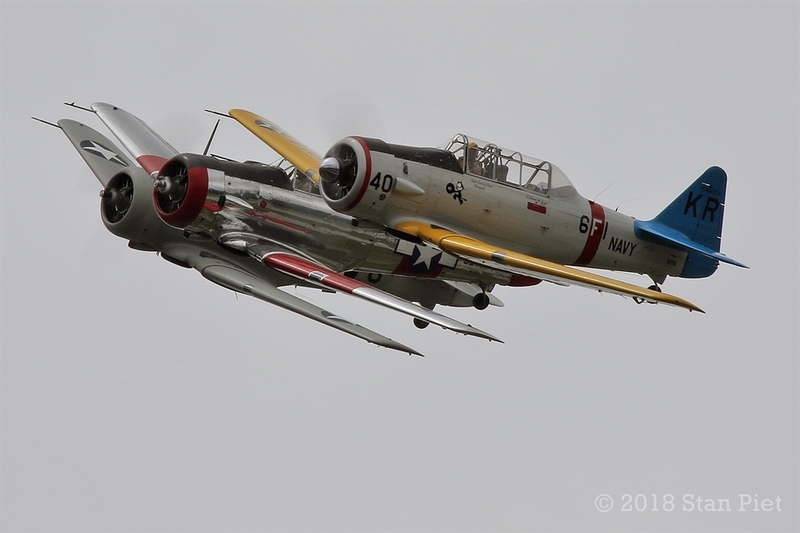 For the best view of this battle, just walk around the back of the vintage Gulf Gas Station in the Home Front, then cross Taxiway Delta where the T-6 Texans are parked. Keep your head down! 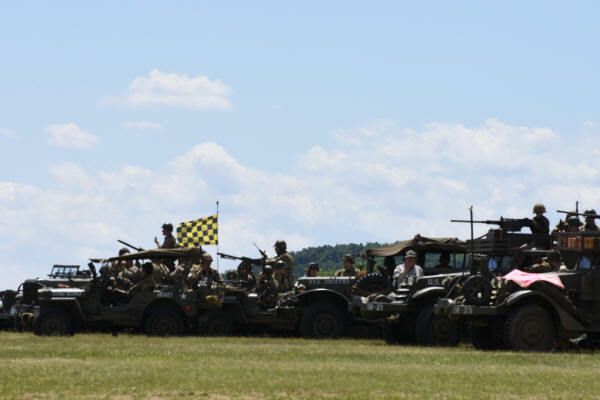 On Saturday and Sunday at 3:00, American infantry and armor attack the Wehrmacht across open ground beyond the show line. 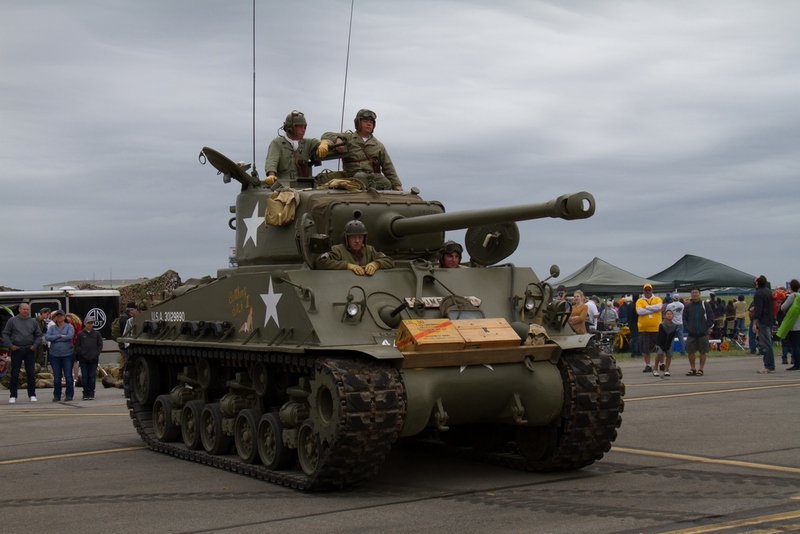 Watch military vehicles and military re-enactor units pass in review on Saturday and Sunday at 3:00. Examine the collections and displays of authentic weapons and gear close-up in the seven encampments. 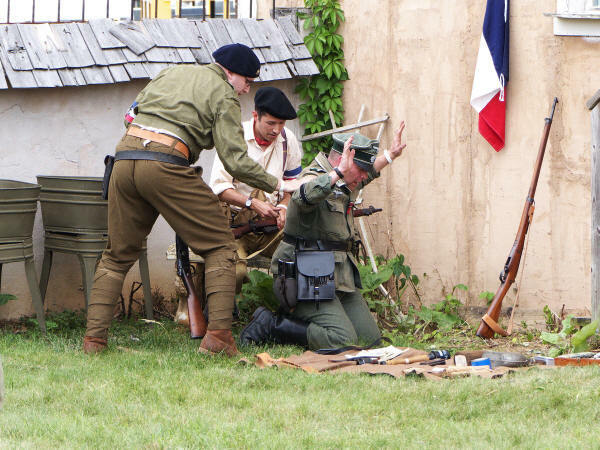 ATTENTION: Some re-enactor/owners will allow you to handle some equipment, but please, always ask permission before touching anything. ...and be on the lookout for those sneaky snipers! It's not just the troops on the front lines who you'll encounter. 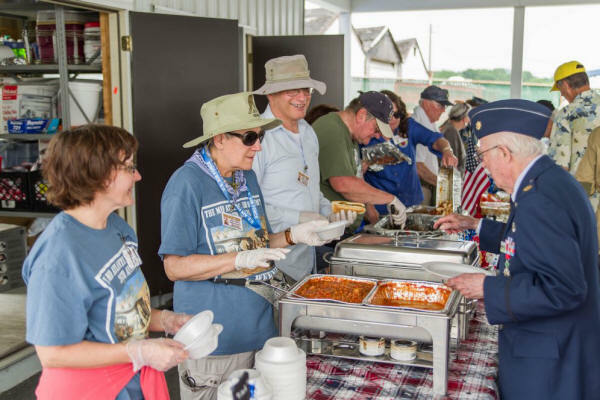 A lot of guys and gals were "in the rear with the gear" doing the unsung but vital jobs that kept the attack rolling and the troops fed, equipped, and healthy. Explore the ruined, but still vibrant French Village. Achtung! You are in German territory! Everywhere you look there is living history before your eyes. Feel free to ask questions. 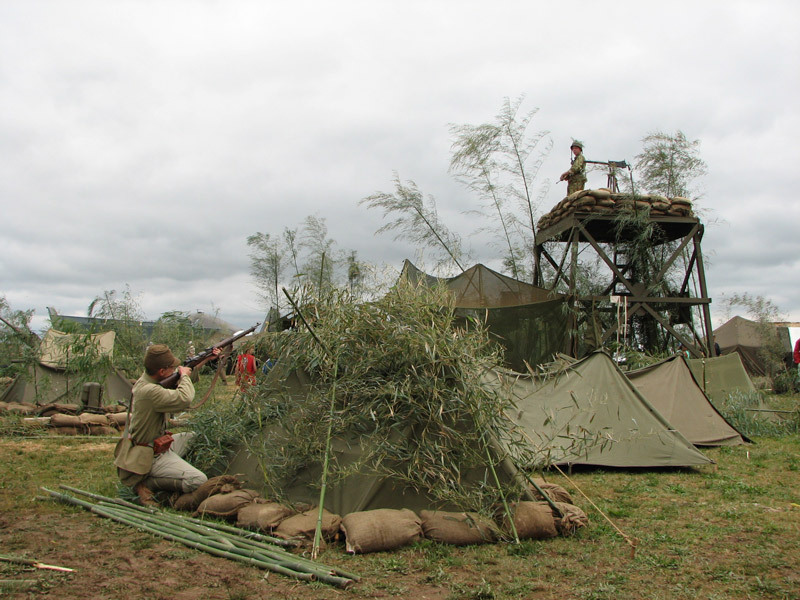 Re-enactors are well versed on the details of their roles, and experts on their equipment. They will be pleased to share their knowledge and passion, and willing to pose for your camera. 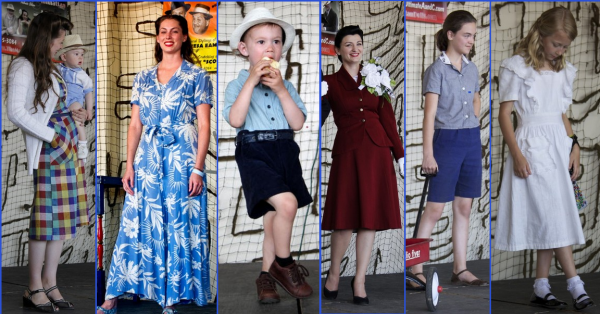 Visit many authentic “Home Front” displays, including air raid wardens, a recreated '40's house, a cottage-style gas station and vintage cars, and a department store selling 1940's items. 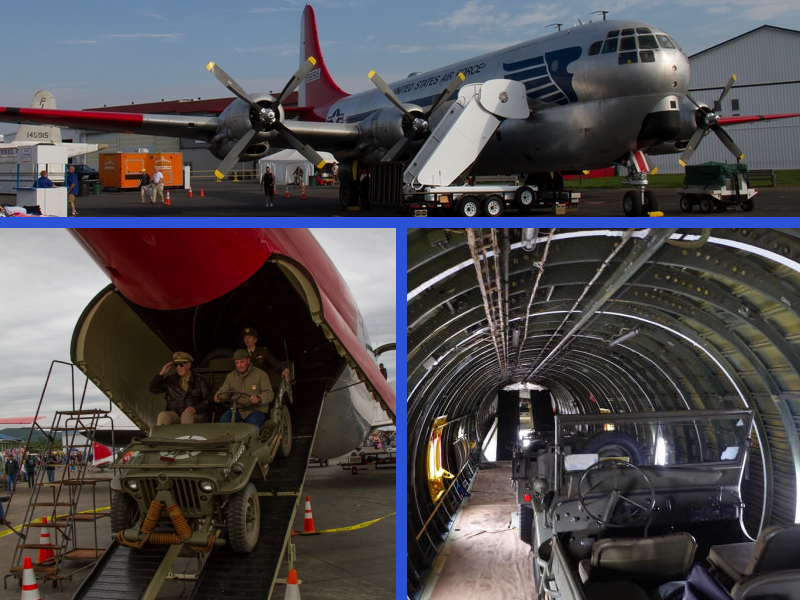 See dozens of beautifully restored WWII aircraft: observation planes, trainers, utility planes, transports, fighters, & bombers. On Saturday and Sunday, from 12:30 to 4:45, many of these wonderful pieces of aviation history will fly during the afternoon airshows. 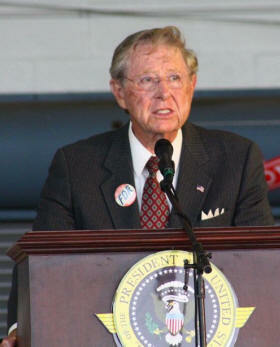 All the action in the sky will be called by Larry Rutt, "The Voice of Experience" airshow announcer. Larry has announced over 300 airshows over the past 35 years. 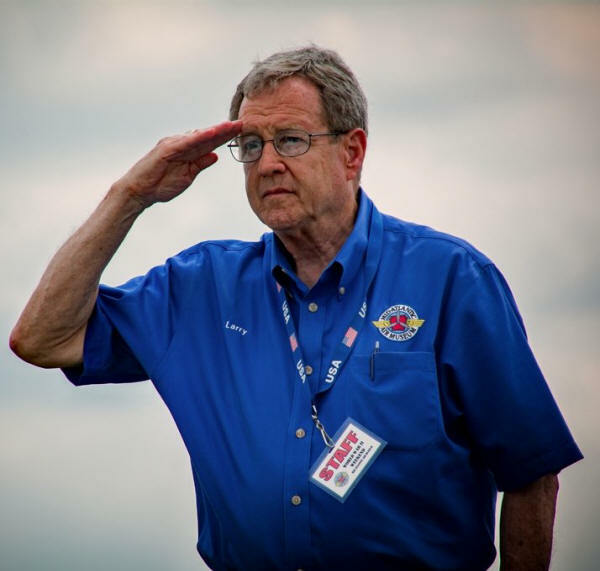 But Larry is no mere "talking head", he has 40+ years aviation experience flying 36 different civil and military aircraft types, from a Pitts S-2A to a Boeing 747-400. But of course, as you've seen WWII Weekend is far more than just an airshow. There is even more taking place on the ground. So for all those times when you aren't squinting up at the wild blue yonder you'll be hearing the "Voice of World War II Weekend". That's "Tech Sgt Ted" Schwartz, who'll be keeping you informed, educated, and headed in all the right directions, throughout the day. 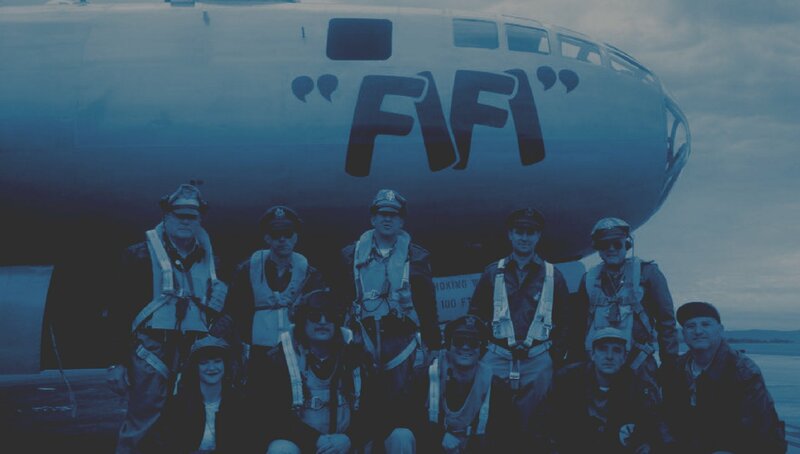 This year you can purchase a ride on FIFI's hangar-mate, the CAF B-29/B-24 Squadron's Consolidated B-24 Liberator "Diamond Lil". 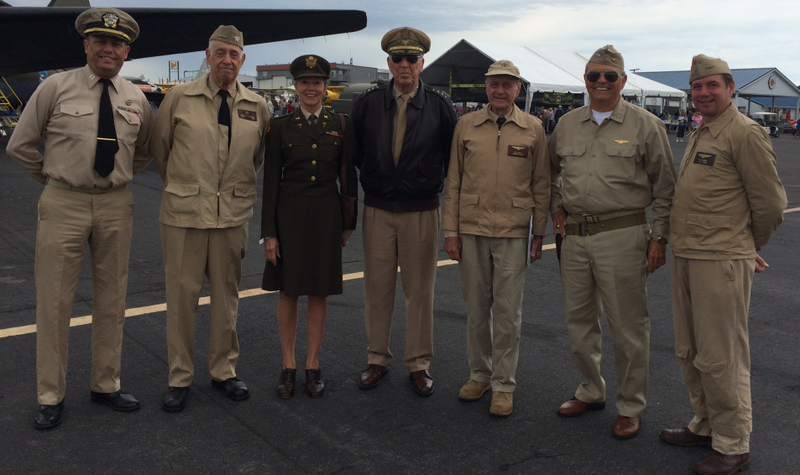 She is the oldest B-24 Liberator in existence, the 25th of over 18,000 built. 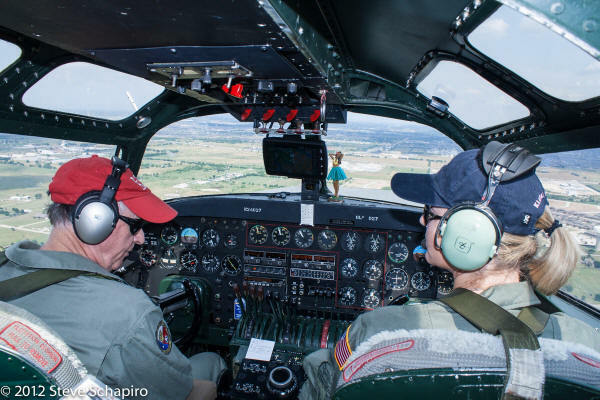 You can take a nostalgic, bucket-list ride on the legendary Boeing B-17G Flying Fortress "Yankee Lady" of the Yankee Air Force. You can also fly aboard the beautiful North American B-25J Mitchell, "Panchito". 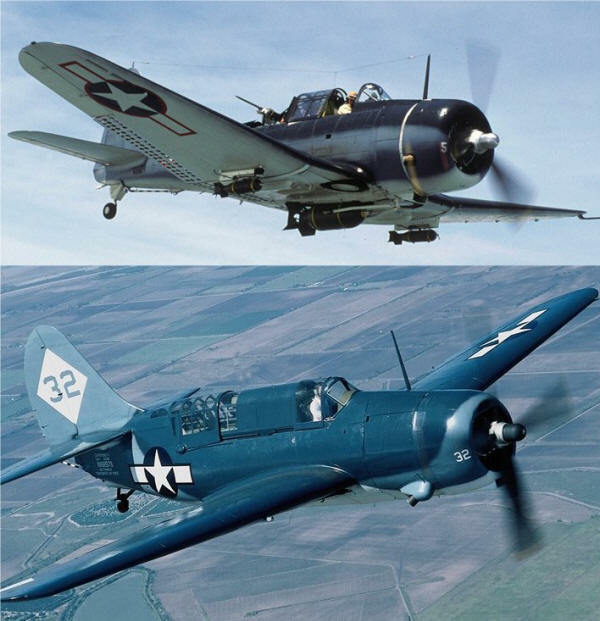 Flown by all the armed services, and made famous by Jimmy Doolittle's Tokyo Raid, the Mitchell served in every theater and earned it's nickname, "Sweetheart of the Forces". "Scratch one flat-top!" Climb into the gunner's seat of either the rare Douglas SBD-5 Dauntless "Lady in Blue", or the one-of-a-kind Curtiss SB2C-5 Helldiver dive bombers, heroes of the Pacific War at sea. 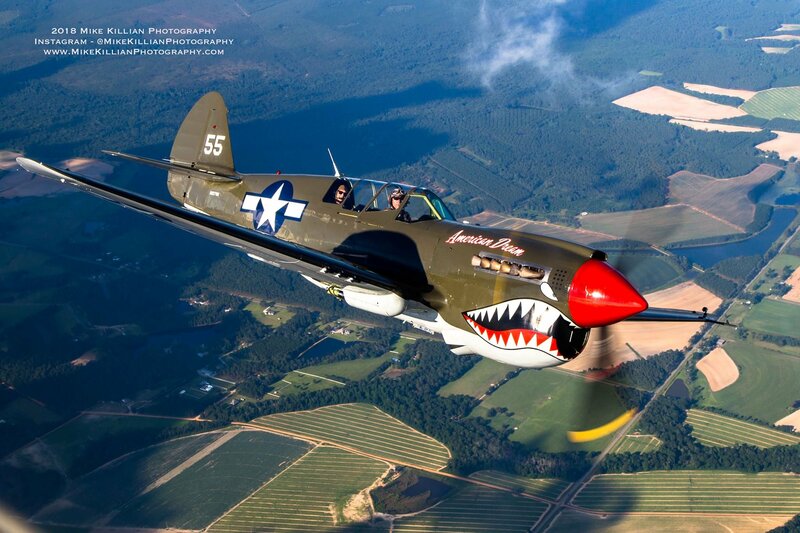 Want to make like a fighter pilot? 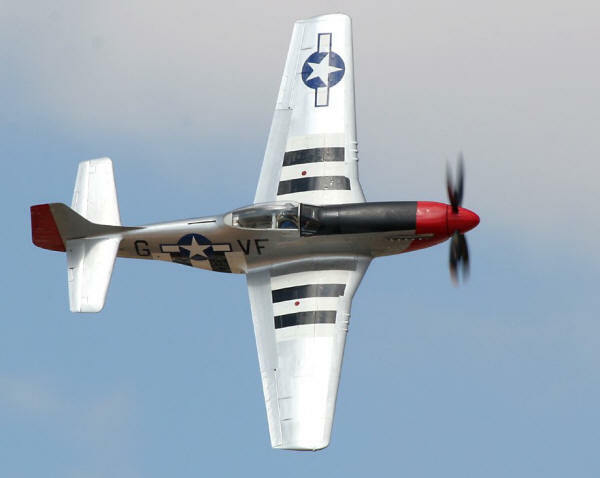 Take the ultimate wild horse ride - fly on the incomparable North American P-51D Mustang, "Red Nose", then brag to all your buddies. 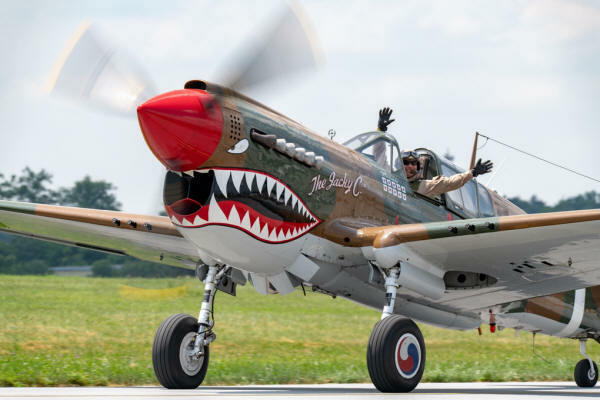 For the first time the super rare Curtiss TP-40N Warhawk "American Dream" will grace the skies over Reading. What makes this particular Warhawk super rare? It's that T in her designation. The "American Dream" is the only operational dual-control P-40 flying in the world, and if you sign up for this warbird, it won't be for just a ride - you will be doing a lot of the flying! If that is your American Dream, follow the link above. 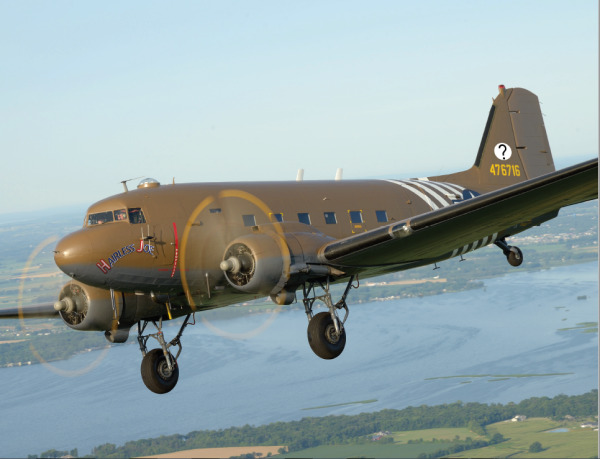 You can ride like a paratrooper in the Yankee Air Museum's beautiful Douglas C-47 Skytrain "Hairless Joe". 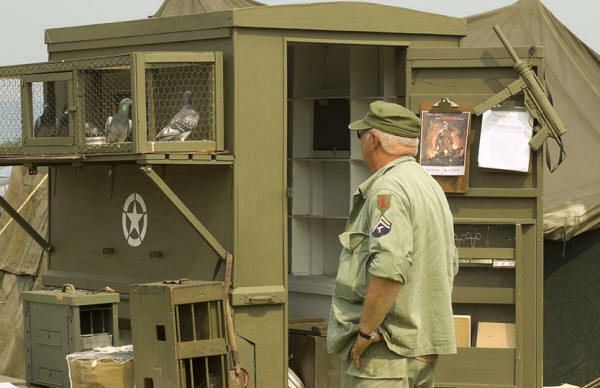 Strap into a seat in one of the paratrooper benches aboard this legendary transport and listen-up for the jumpmaster's commands. 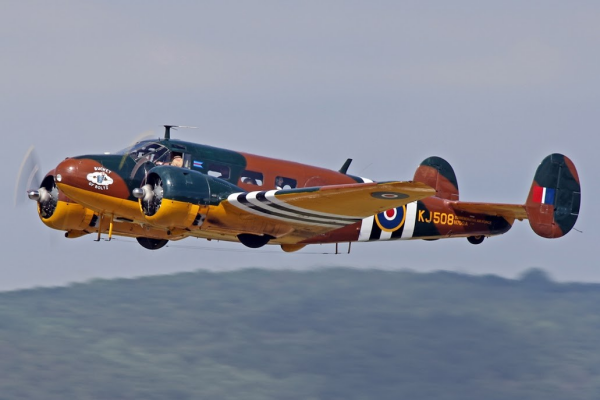 ...or, fly like a General on this smaller twin-engine transport. 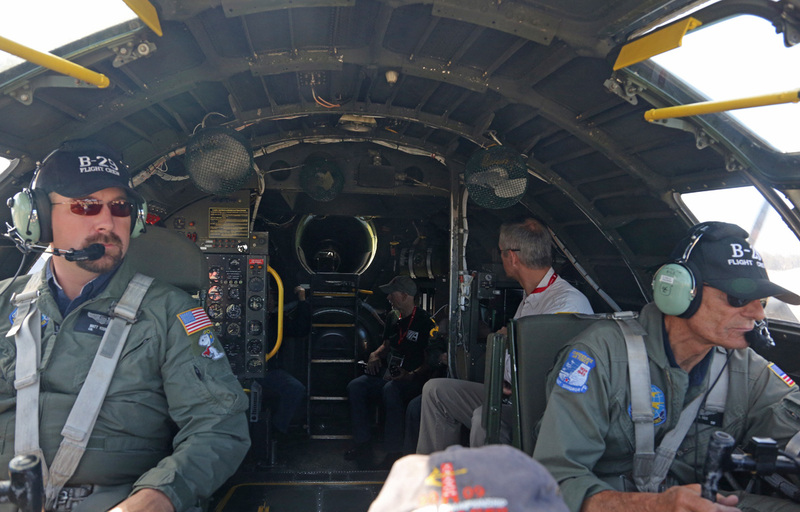 With or without your "staff", you can board the Beechcraft C-45F Expediter, "Bucket of Bolts" and survey your command from the air. For something a bit more sporty, fly aboard one of MAAM's fleet of training aircraft. 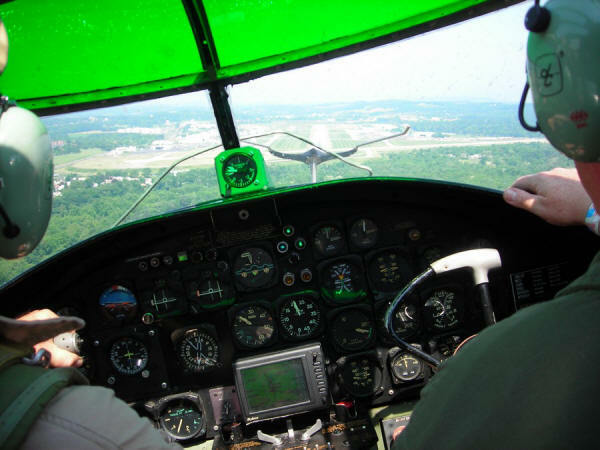 You can choose the primary trainer, the open-cockpit Fairchild PT-19 Cornell. 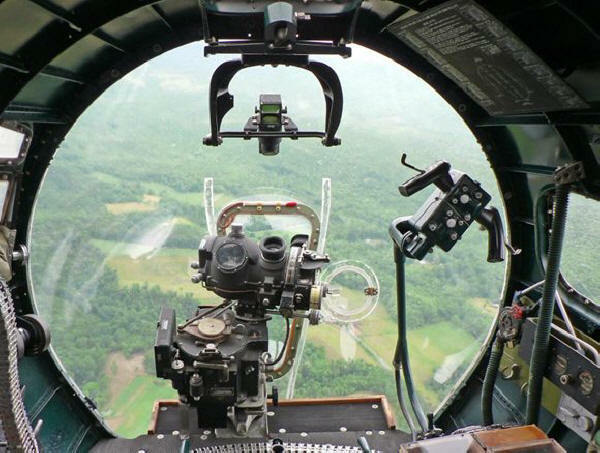 Or you can fly in the powerful advanced trainer that was the final stepping-stone to a fighter cockpit for thousands of Allied pilots, the North American SNJ-4 Texan. 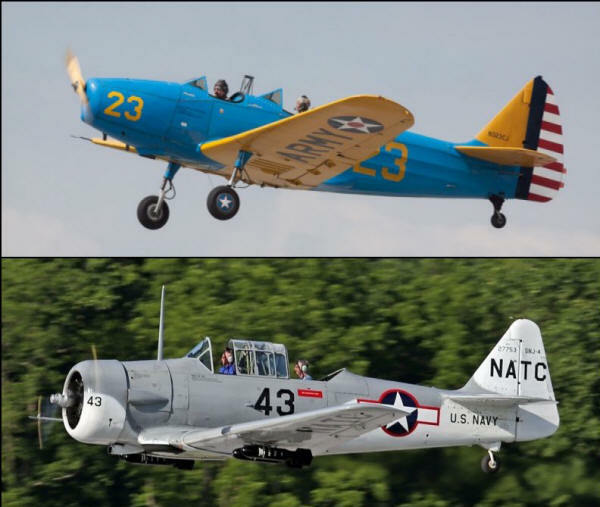 The price is the same for both planes, so take your pick, and get ready for a view of the show that can't be beat for the money. 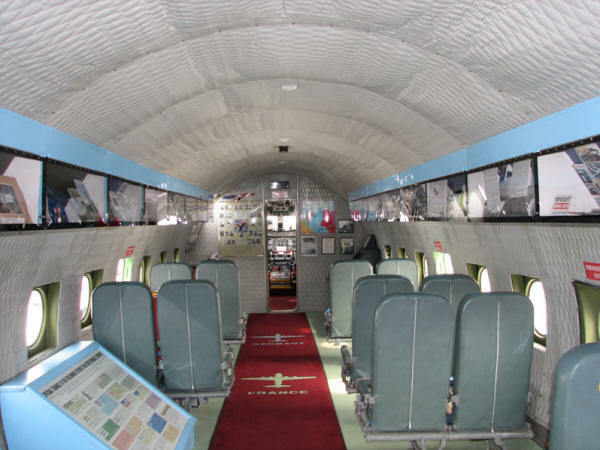 You will also have a chance to go aboard and tour some of these same aircraft, and other airshow attendees, such as the Berlin Airlift Foundation's Douglas C-54E Skymaster "Spirit of Freedom" with an airborne museum in its cabin that containng exhibits documenting the heroic, lifesaving Berlin Airlift of 1946 in which this very airplane participated. Also here from the Berlin Airlift Foundation is the fabulous Boeing C-97 Stratofreighter. 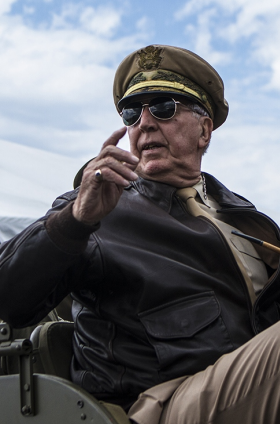 You can tour this aerial behemoth from cockpit to tail ramp - just don't get run over by General MacArthur's jeep! There will be nominal charges for some of these tours, supporting the upkeep and restoration of these wonderful aircraft. Refer to the Airshow Roster Page to see which planes offer tours. Hear Delmas P. Wood as President Franklin Delano Roosevelt deliver the stirring "Day of Infamy" declaration of war speech at the evening hangar dance which begins at 7:00 on Saturday. 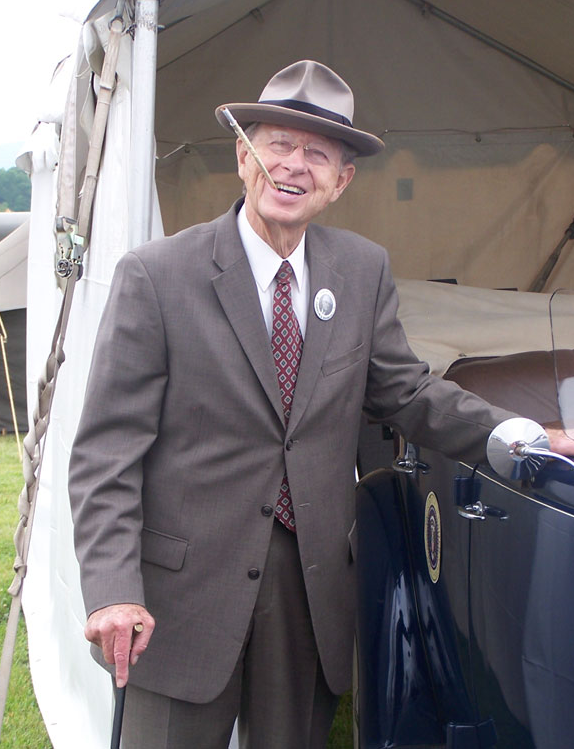 And don't miss your chance to talk to the President and have your picture taken with him as he relaxes between "new deals" (FDR was an inveterate poker player). 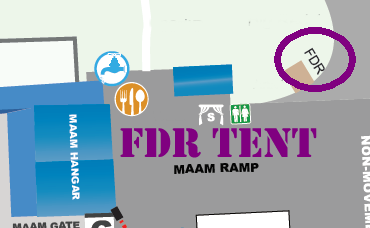 When he is not being chauffeured around the area, you'll find him in his tent, located to the right of the main show stage, at the edge of the MAAM Ramp. As you explore the encampments and the show ramp, you may well encounter some high-rankng "brass" among the military re-enactors. US Army Generals Douglas MacArthur, George Patton, and Joseph Stilwell will be in the area. The Navy will be represented by Admirals Chester Nimitz, William Halsey, and Raymond Spruance as well as a young Lieutenant JG named John F. Kennedy. On Saturday and Sunday at 12:00, be on hand as General MacArthur meets President Roosevelt upon his arrival at the foot of the C-54 Skymaster's air-stairs. 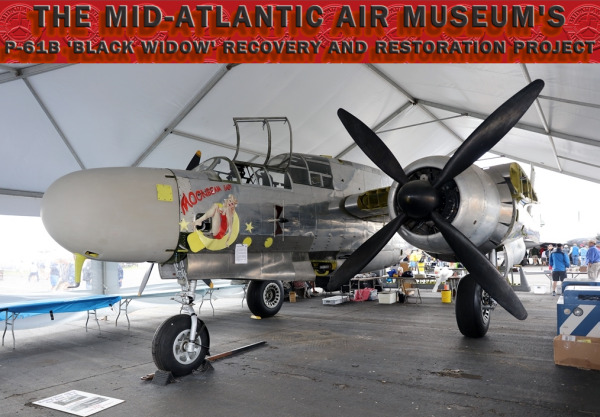 MAAM's ultra rare P-61B "Black Widow" will once again be out on the ramp under her own tent, so be sure to stop by and see the progress that's been made since last year on the restoration of this amazing aircraft and chat with the team. 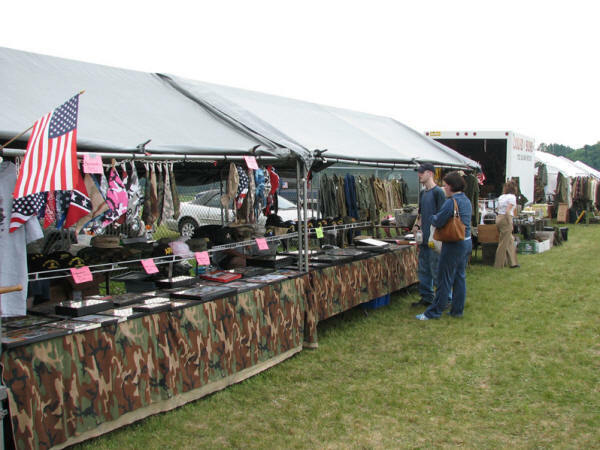 While you are there, why not buy some Black Widow apparel, and other souvenirs to support the cause. You can pick up a copy of the beautiful and fascinating book, Forgotten Window, or just drop some cash in the P-61 Donation Jar to help us make the MAAM P-61B the only Black Widow in the air. 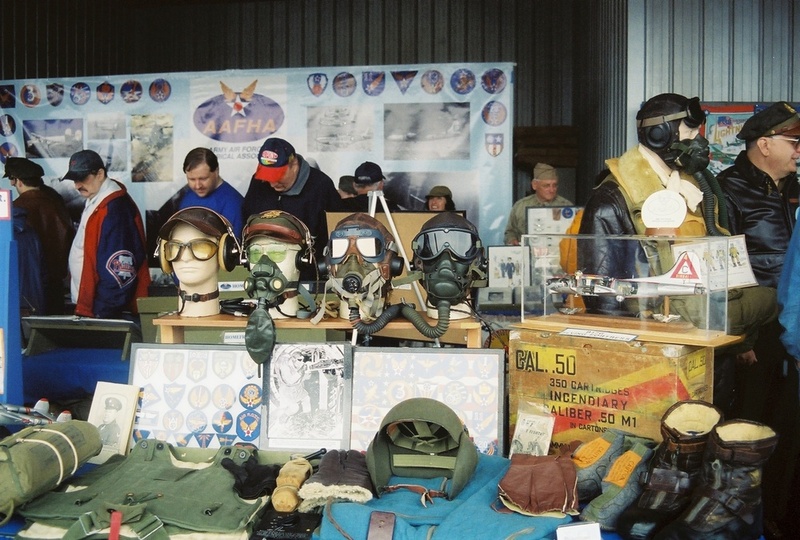 Shop the extensive militaria flea market – 120 plus vendors make this one of the nation's largest. 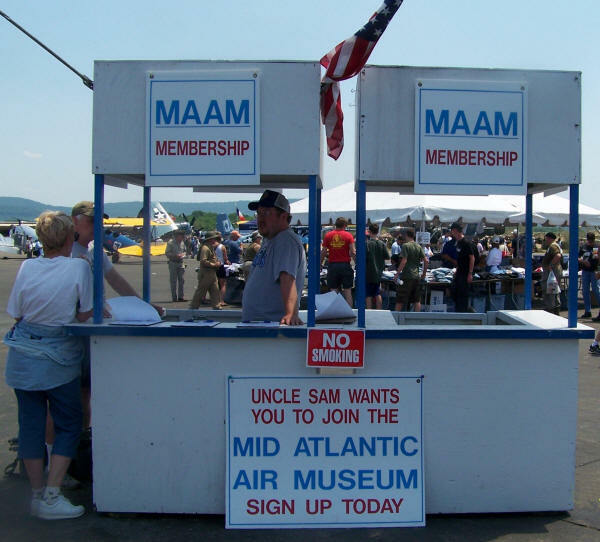 The Main MAAM Hangar, in addition to being the most imposing feature on the show grounds, and therefore a popular rendezvous, is chock full of fascinating educational displays of memorabilia, military equipment, models, art, books and much more. 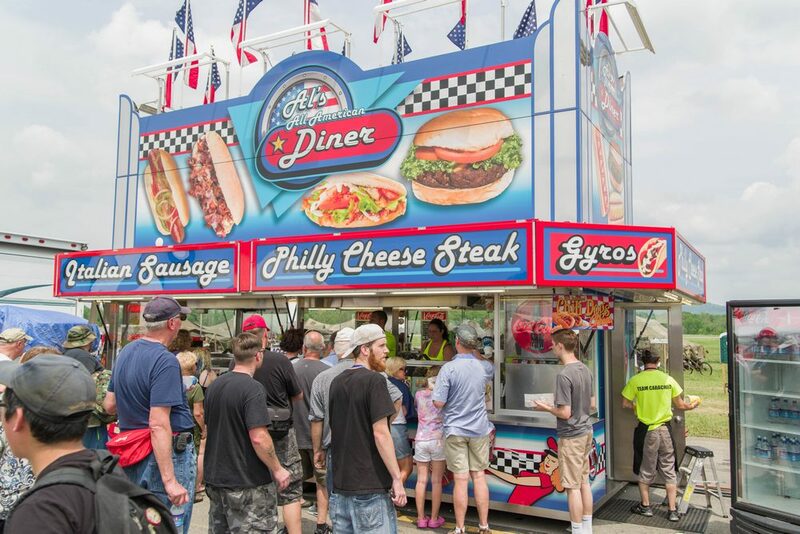 A variety of food vendors are on hand at the show to slake your thirst and satisfy your appetite. You will find outdoor food courts on the MAAM Ramp near the Main Gate, outside the Main Hangar doors, and on Taxiway Hotel near the Flea Market. If you hunger for something a little more GI - and we don't mean gastro-intestinal - check out the CAP Mess for breakfast. It's run by, and benefits the local Civil Air Patrol chapter. 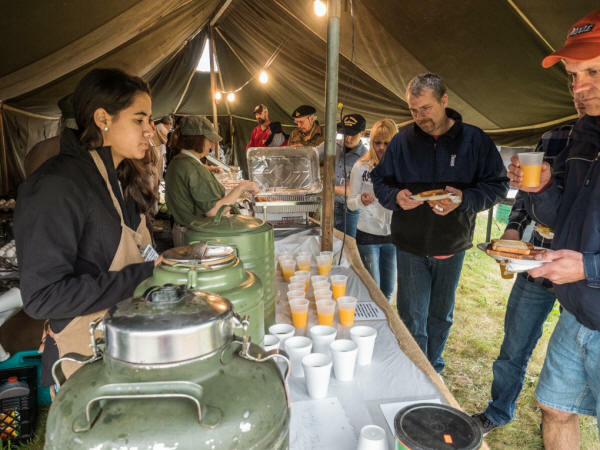 The chow is just like your old mess sergeant used to make, except without the powdered eggs and all the other reconstituted stuff, and you don't get stuck with KP! Are your dogs tired? 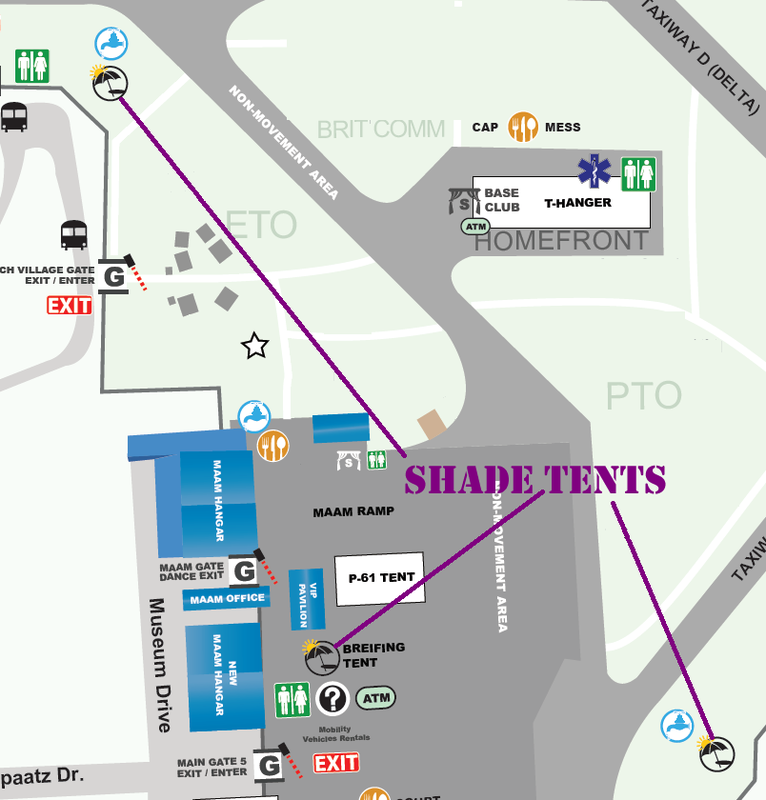 Take a load off at one of our shade tents. You may also bring along your own lawn chairs. We can't draft you, but we can try to recruit you! 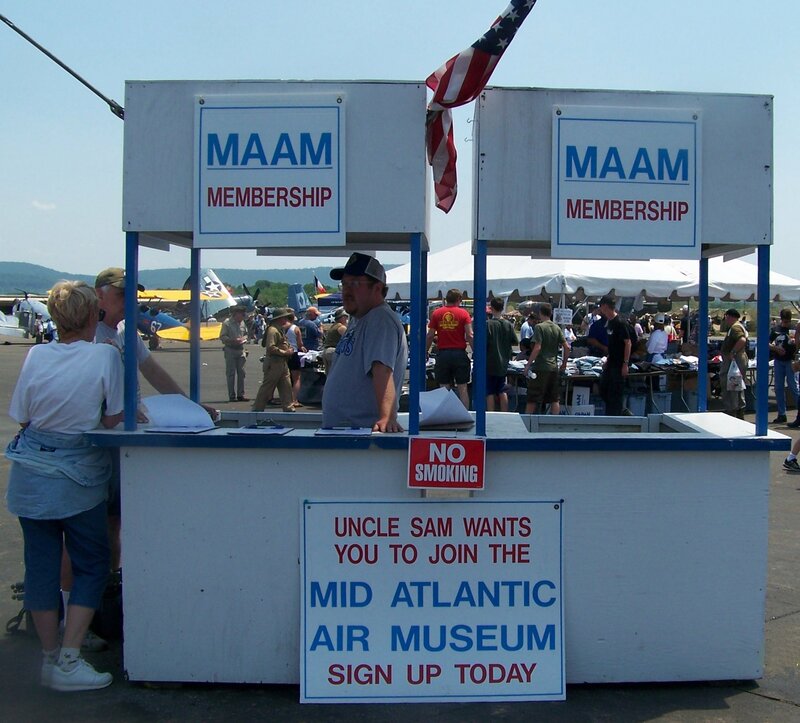 Take advantage of a show discount and become a member of the Mid-Atlantic Air Museum. Next year you can get a free one-day WWII Weekend ticket, or even volunteer to work at the show, if you wish. Need some quick cash? 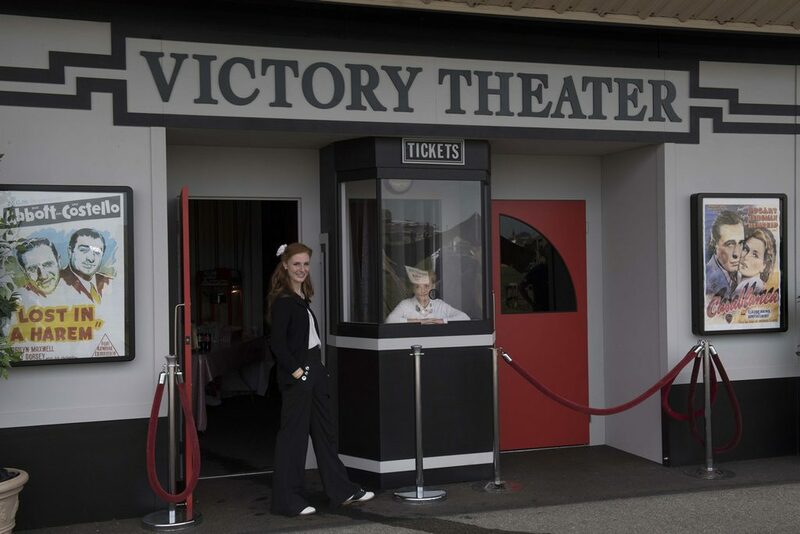 We've got you covered - just stand under the awning and punch in your PIN. 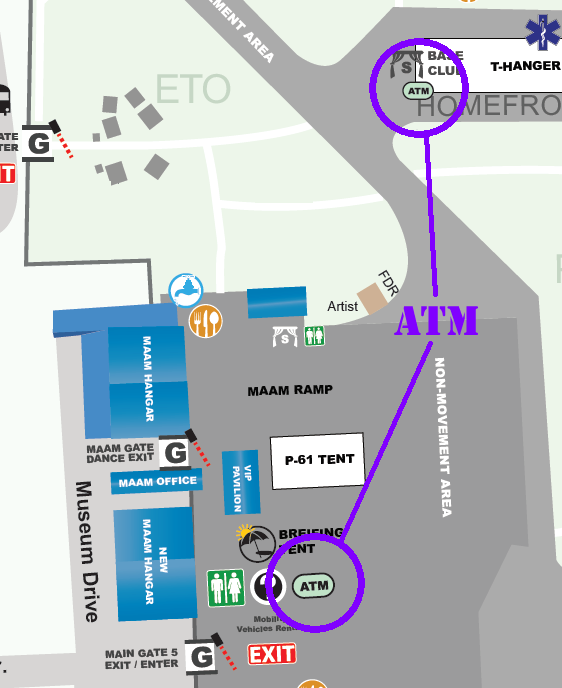 There is one ATM at the Home Front near the Base Club and another near the Main Gate on the MAAM Ramp. 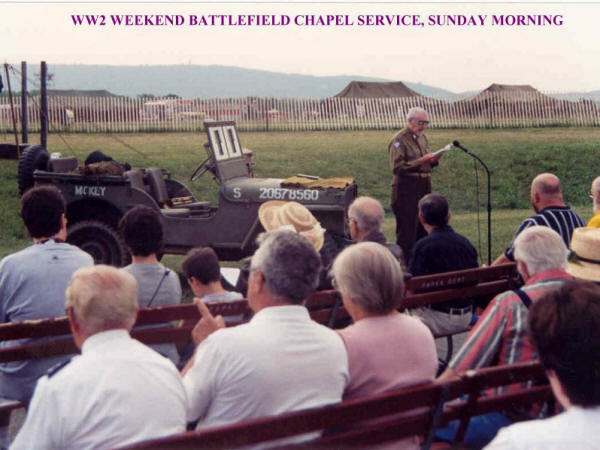 A Field Mass is held on Saturday at 5:00 PM at the 28th Chaplain's tent beyond the Militaria Flea Market. 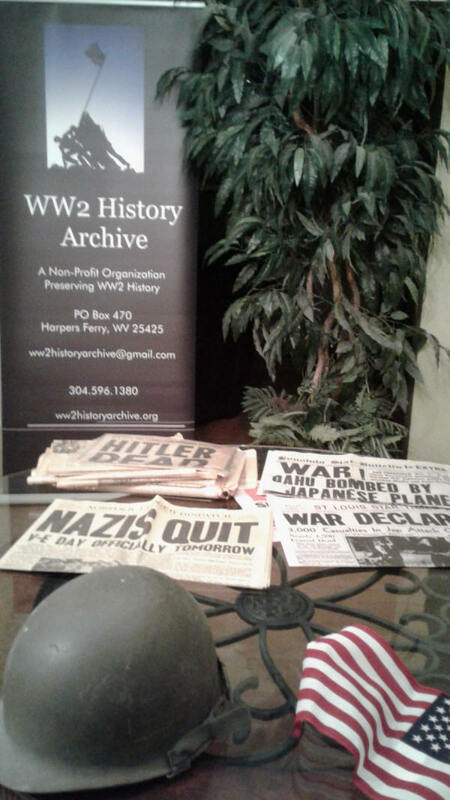 * The show map details on this page were all excerpted from a past WWII Weekend Map. 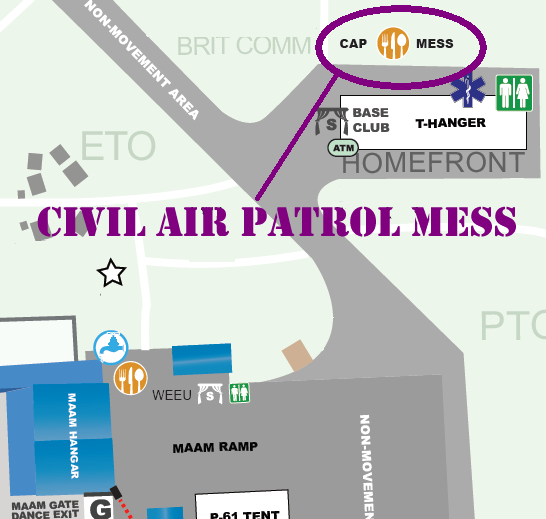 Re-enactor unit designations and locations in the encampments and aircraft parking areas have been omitted eliminated for clarity. 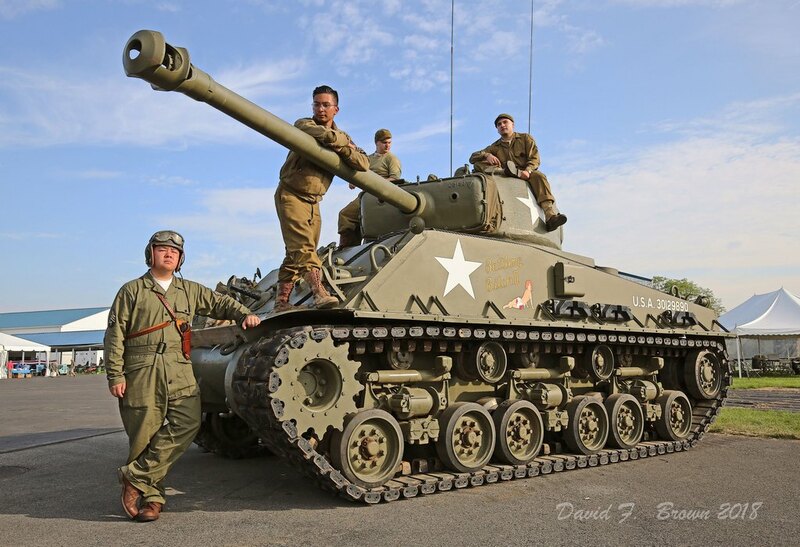 For a complete and up-to-date WWII Weekend Show Map for this year's show with all these items included , click here. 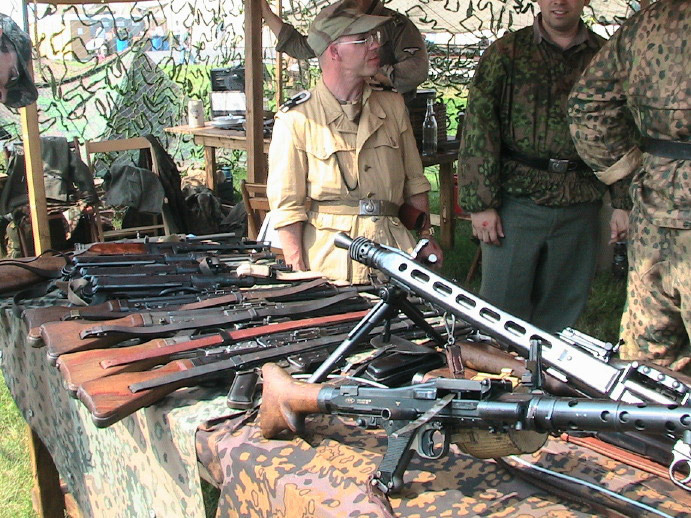 There is much, much more to show and tell about World War II Weekend. 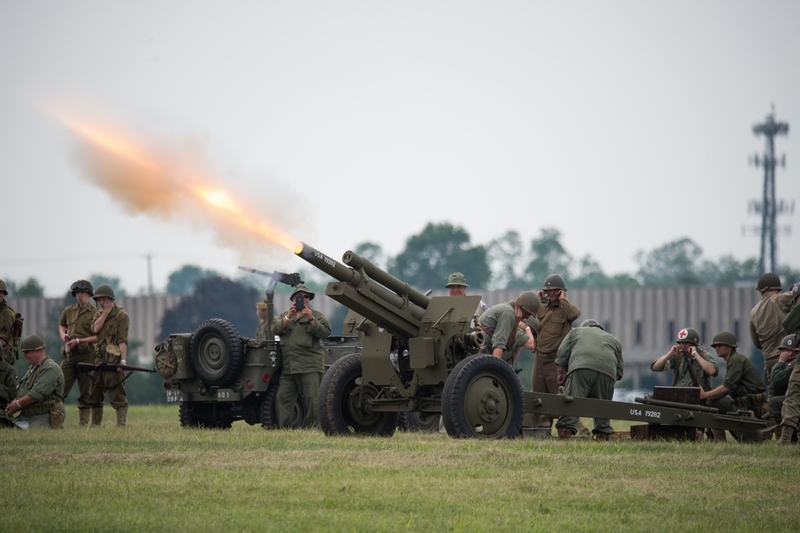 Explore the rest of the WWII Weekend Web and then order your advance tickets, because we can promise you one thing: you'll have an unforgettable experience as you go back in time with us to learn about, and from, the brave men and women who lived it. 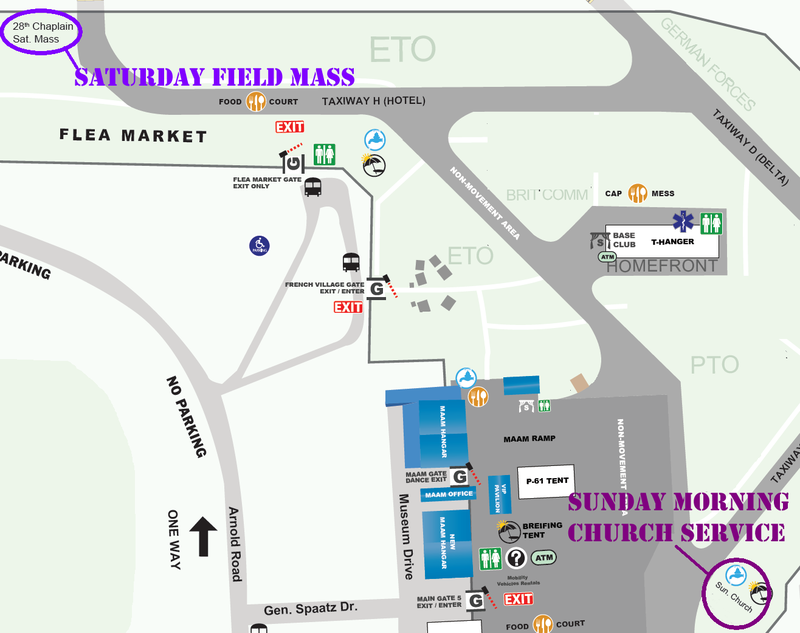 Gates open each day at 8:30 AM. The Public will not be admitted before that time.